Nice! Have never seen these before..
great pics. 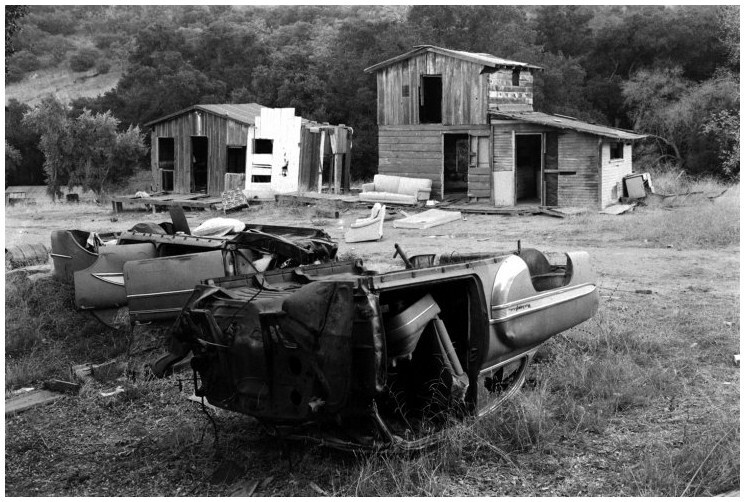 i am really partial to black and white as it really depicts just how stark those manson family hideouts were. looking at the barker ranch, one can readily see how brooks poston would convert for some low end baloney sandwiches served by 'mind meld guru' paul crockett. That cop in the last picture looks like he's "ready to rumble". LOL. "What we have hee-yah, is a fay-yuh to ca-myoon-i-kate". Those are some great pics, thanx to whoever is responsible. 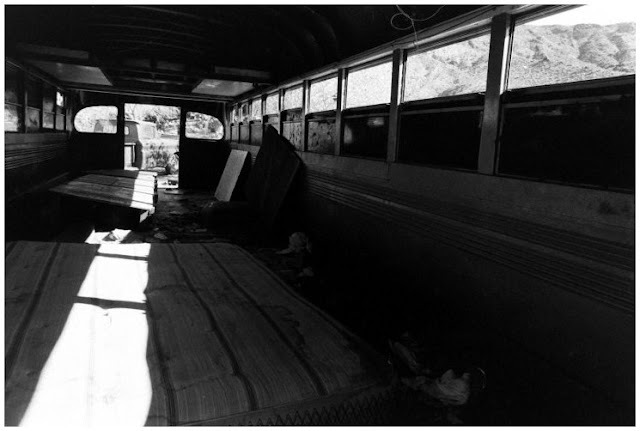 I'm guessing if that's a pic of the interior of the Manson bus, it was taken after Hendrickson filmed it. 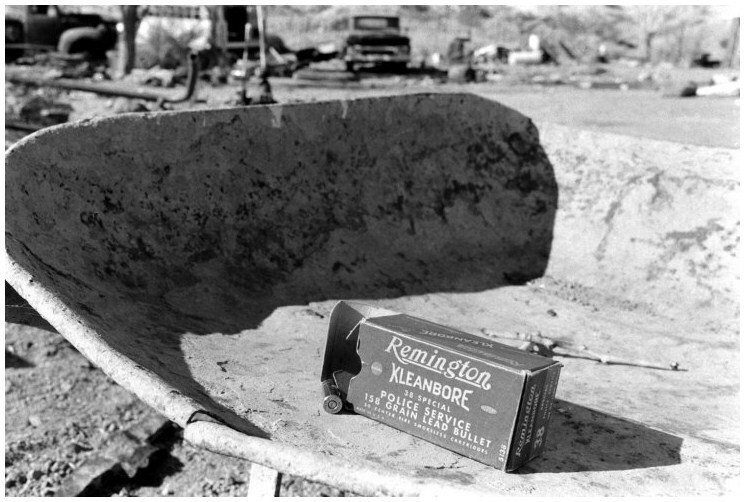 In "Inside the Manson Gang" "Clem", "Gypsy" and "Squeaky" can be seen removing the contents of the bus. It looks like several large bundles of clothing. In fact there appears to be a broken down wheelbarrow being used that may be seen in another one of these pix. The pick up truck behind the bus is seen in the Hendrickson film (in color) and here in b/w. 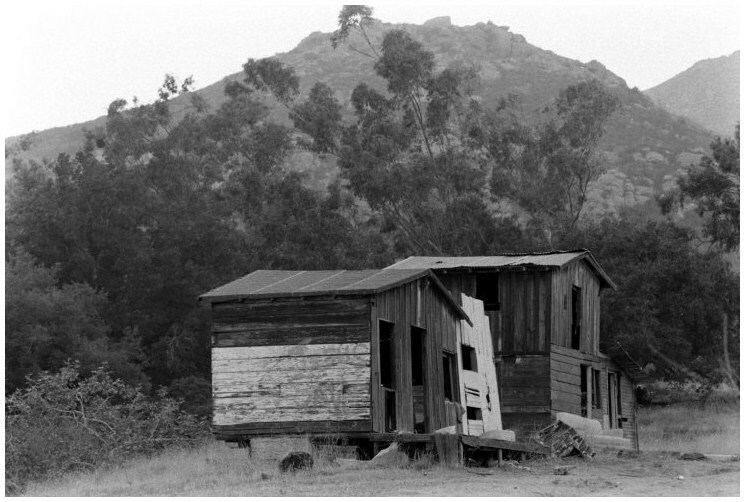 In the pic taken from the hill behind Barker, at the bottom, there appears to be some water in the "pool", "cistern", or whatever it was. I think Watson said he swam in there in his book. I've now become curious as to what power source was used at Barker and Meyers. In the Hendrickson film I just re-watched, a hot water tank could be seen in the yard. 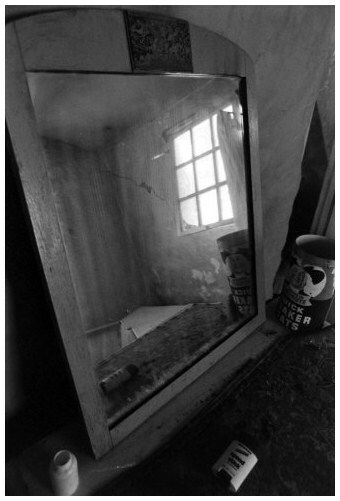 A broken down fridge in the dump pic here in the last post. Watkins said in his book "all the lights were on". Were electric lines strung to that remote area, or did they have some type of generator? 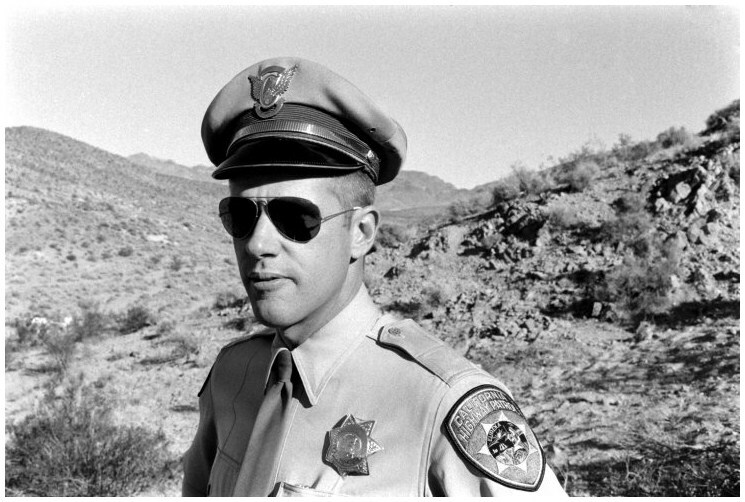 Truth be told... them "california cops" in the 60's, were probably the most lenient plicemen around. 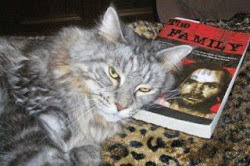 You'd think Manson and company had 12 lives... if not 50. It seems they got a slap on the wrist for everything. "I can't wait to get home from this desert, and eat some pancakes with molasses!" Farflung just positively identified the car in our first photo (thread below), as a 1953 Pontiac Chieftain. I added Farflung's photo... and we got a match! If you find any other uncanny matches... send'em in. I'll put those up too! Watkins said in his book "all the lights were on". 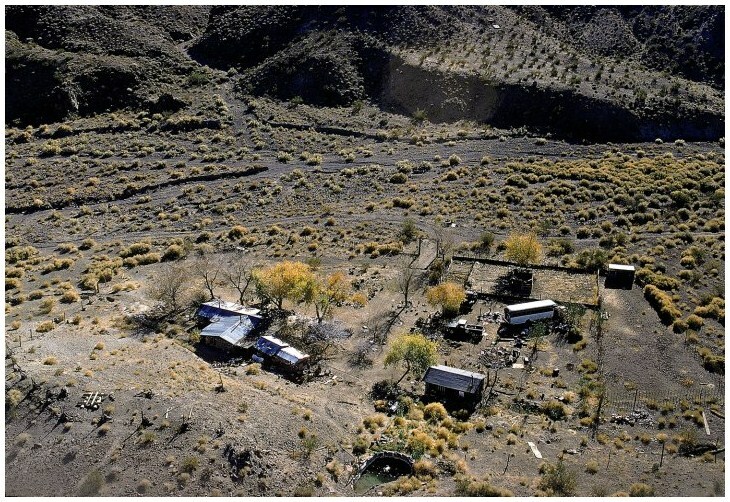 Were electric lines strung to that remote area, or did they have some type of generator? Though I like Watkin's book a lot there are tons of errors in it. I suspect many of the errors were written by his editor trying to class up the writing. I always wondered how they could listen to the White Album up at Barkers. I just did a Google search to determine if generators were available in the 1960's. Behold, the 1960 Onan Generator at Idle. Where I come from, lights, hot water tanks, refrigerators, and record players all run on electricity. I'm guessing that unless there were electric lines strung from the Las Vegas side to Meyers they had a generator sitting around there somewhere. I've never heard any mention of it, but Watkins mentions drums of gasoline, they could have been used for a number of things, including filling a generator. It's my understanding from Watkins book that the majority of the Manson family stayed at the Meyers Ranch. Crockett, Watkins, Posten, Wildebush, and a person I think named "Bo" stayed at Barker, while Manson, Clem, Tex, and most of the other girls stayed at Meyers. Watkins said there was construction equipment around there, his book says they burned several pieces of it. 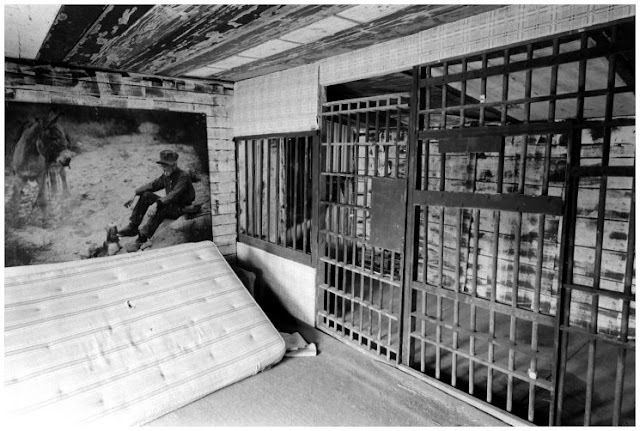 I'm guessing the Manson family may have "found" a generator as they can be found on constrution sites. Yea Farflung! Good work! Okay where are my pompoms.....LOL. Lynyrd you should offer Farflung the position of technical advisor! Sunset, I don't know for sure, but I doubt they had electricity there. It was probably generator-powered. I can't imagine anyone investing in the cost of running the poles with transformers & wiring all the way out there. But that second floor door is definantly a hay storage egress. “Here, Lynn.” I took a five-carat emerald ring off my little finger and handed it to her. Then I walked into the courtroom"
FIVE CAROTS! That ring had to have been stolen property. 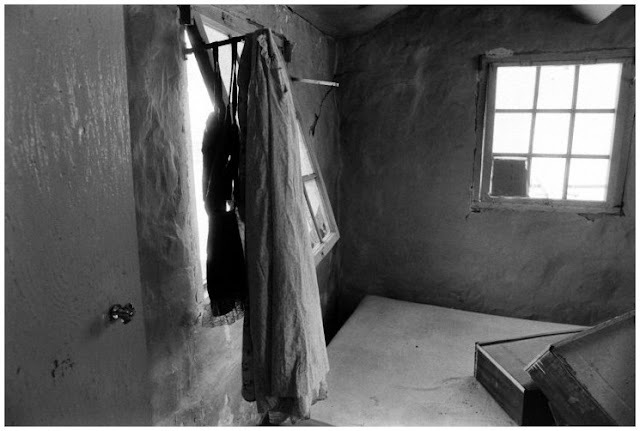 In looking at these pictures, I'm still amazed that any girl would opt to live in these conditions. I just can't conceive of that mindset. Some of these girls came from families with money. What a vast difference to the life they were used to. I can't imagine living in the desert without any A/C. I think the photo of the wheelbarrow with the box of bullets is iconic. See that vehicle at the top of the photo with the wheelbarrow? Can you match it (the truck) to any of the pictures from the dump? I don't remember what kind of truck was in the "graveyard" in the photo just above the fridge.. I took a lot of pictures that day, I'll have to go through them to see the front of that truck...hopefully I took one. The pickup truck behind the Manson bus can be seen in the movie "Inside the Manson Gang". It's sitting right behind the Manson bus. It's kind of a bluish green color with a white bumper. It appears to me to be a late 50's Chevrolet, but that's only a rough guess. My dad had a late 50's Chevy pickup. Also, as I just re-watched some of the Hendrickson movie, "Clem" can be seen rolling up to the gate at Barker in what appears to be a Jeep. Not much can be seen of the vehicle, but it appears the hood is a red primer type color with a twin white stripe down the hood. I think there was a Jeep type vehicle in the dump in a previous post that may have been red. Now...back to identifying cars. LOL. Sunset, I haven't seen that movie so I really don't know what Clem was driving. Does anyone else know? to follow up on Katie's comment, how in the hell can you keep a number of young people --especially young women-- out there on Barker Ranch. "I'm tired of being hot!" "Charlie, she keeps bugging me...."
"I get to sit in the front." "Ow, a scorpion bit me." "I can't get the dirt outta my teeth." "Did anyone think to bring some dry shampoo?" "You used all the sunscreen!!!" "I miss the dumpster food." "Next time, we're gonna use YOU for target practice." I found a picture of the front of that truck, I sent it to Lynyrd, maybe he will post it. Paul Watkins mentioned a yelow jeep in his book. Said that Charlie left a yellow mark on the rock walls up Golar Wash. That may be Charlie's yellow jeep carcass in these pics. It was the yellow jeep that first enabled Charlie to overcome Paul Crockett's voodo force field and finally get up to Barker's in October 69. Kimchi I really liked the story from your uncle!